With the Dawnguard update, elemental explosive bolts were added to Skyrim, but the vanilla bows never got the explosive arrows they deserved. 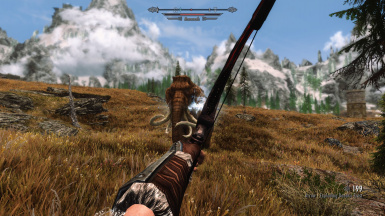 Simple Explosive Arrows is here to alleviate this issue and add new exciting options for archers in Skyrim. 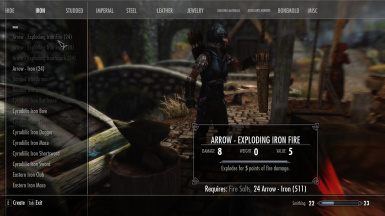 Simple Explosive Arrows picks up where Dawnguard left off and adds all new arrow varieties for all craftable arrows in Skyrim Special Edtion. The arrows are designed to be balanced, lore friendly, and accessible to all characters. In addition to adding all new arrows, this mod modifies all existing arrows to fit a new naming scheme created in Kevkas' Arrows and Bolts Tweaks. Arrows are now listed as Arrow - [type] to be easily identified in menus. 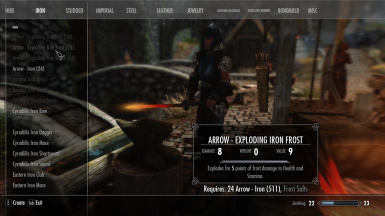 The mod also makes use of a new pricing and damage model for vanilla arrows originally created in ABT. The value for several regular arrows has been slightly modified to increase uniqueness among arrows in Skyrim. Nordic Arrows now deal 15 damage instead of 14 and Stalhrim Arrows now deal 22 damage instead of 20. Additionally, this mod currently uses the 100% arrow and bolt speed increase tweaks from Kevkas' mod. This means that mods such as Simply Faster Arrows and any other mod that increases the speed of vanilla arrows will not be compatible with my mod. All new arrows will be twice as fast as vanilla arrows, and all vanilla bolts and arrows have been changed to match this difference. I am working on a vanilla add-on to the mod that reverts arrow and bolt speed to vanilla, but for now, all arrows and bolts will be 100% faster than vanilla. These tweaks should help accurately fire arrows and bolts at the center of the crosshair. 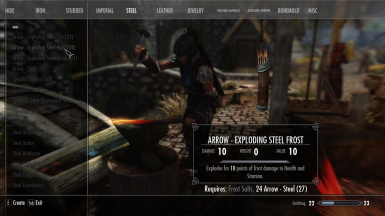 This mod should load after any file that modifies arrows and bolts within vanilla Skyrim such that the tweaks in this mod are loaded properly. Additionally, all arrows (except dragonbone) have been added as leveled items. Explosive Arrows can be found in most places that regular arrows can be found and have been added to the leveled lists for blacksmiths and certain enemies. I recommend using Wrye Bash to create a patch with merged leveled lists. This should work with just about any mod. 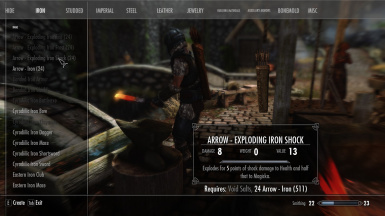 If you use any mod that modifies the arrows and/or bolts from vanilla Skyrim, this mod should come after that mod to replace those tweaks and maintain consistency among new arrows and vanilla arrows. This mod was obviously created with my own personal tastes in mind, but I am working to create a patch that fits the vanilla style as well so that anyone can enjoy the mod I have created. Any feedback is appreciated, notify me if you spot any bugs or know of any additional incompatibilities with other mods. This is my first fully functional mod for Skyrim (SE) but I hope to expand upon it and make it better in the near future. The later arrows such as Ebony and Daedric are very powerful. While they can make the player deal more damage, enemies can also use them against you, so they do not end up being overpowered (at least not in my opinion, that is). Huge thanks to kevkas for letting me use some of his tweaks from ABT in this mod. The entire mod is contained within the .esp file. Add this file to your "\Skyrim Special Edition\Data" folder or use a manager such as NMM to do it automatically. Simply remove the .esp file to uninstall the mod or use a manager such as NMM to do it automatically. Please endorse the file if you enjoy it. I did spend a decent amount of time on this, so I hope you enjoy it as much as I do. Please let me know of any issues you find, and send cool screenshots my way if you have any. If you have any intent to use my file or upload it to any other site, please contact me first to gain my permission.